The Lithuanian Foreign Ministry operates in the United States two Consulates General, in addition to the Embassy in Washington. These Consulates General look a lot like the city hall of a Lithuanian mid-size town. Nevertheless, there is more than what meets the eye. The Consulate General in Chicago is the largest in the USA. The other Consulate General is located in New York City's Manhattan. In addition to serving the Lithuanian population, it plays an important role in promoting Lithuania. 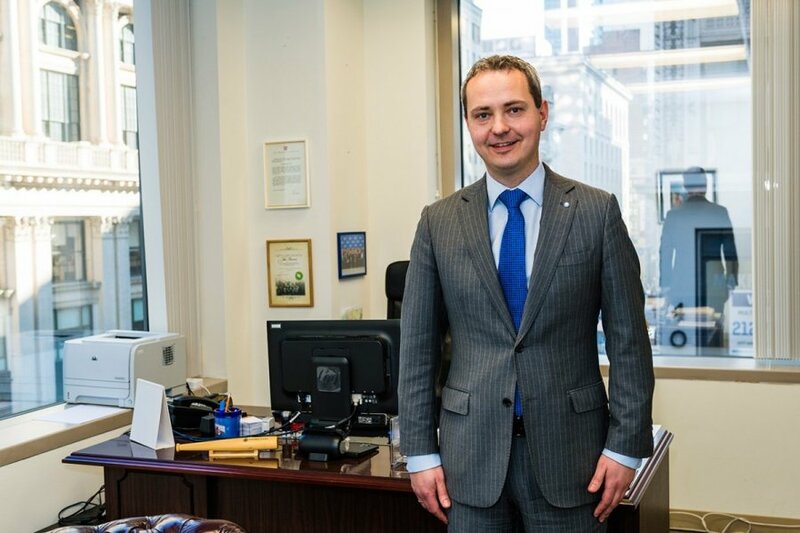 The Consul General and his staff sell Lithuania as a place to do business. They encourage American companies to use the country as a base to serve the North-western part of Europe and to get a foot in the door to the EU, the world largest trading block. The new Consulate General in Los Angeles is expected to open by the summer. From Los Angeles they will serve the fast growing Lithuanian West Coast population and build bridges to the increasingly important high tech and creative industries located in that part of the country. Lithuania's Consulate General in New York City overlooks the busy corner of Fifth Avenue and 37th Street right in the centre of Manhattan's hustle and bustle. 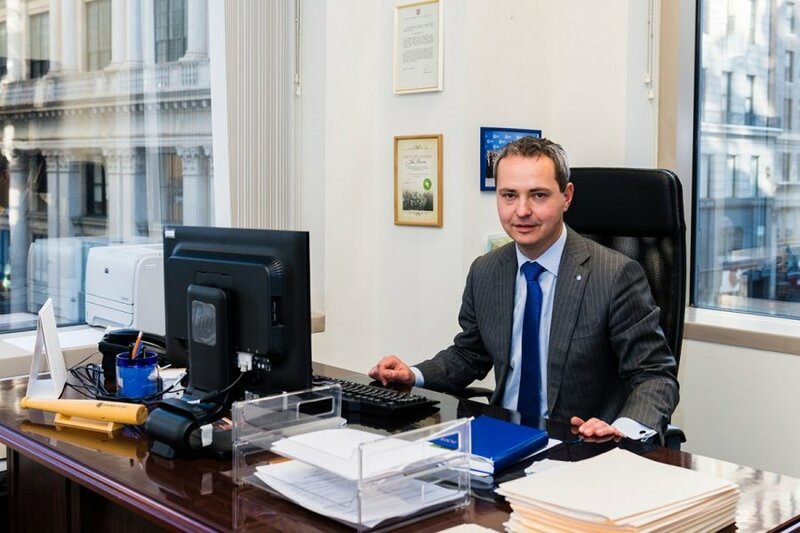 The Lithuania Tribune meets with Julius Pranevičius, for a few months now, Lithuania's new Consul General. The dynamic 38-year-old native of Ukmergė is clearly enjoying his newest challenge. What is the role of this Consulate General in New York City, given that there is a Lithuanian Embassy just 4 hours south, down the road in Washington? The United States is a big country. It is nearly impossible to serve that country from one place. That is the reason why almost all EU countries have a consulate-general in New York, a city with a population of more than 8 million. Some countries have a consulate general in New York that is larger than their embassies. In the case of Lithuania, we have also a large Lithuanian born community living in this city. In addition to serving our population, many companies have their HQ activity in this city. This city has also a very active cultural life. It is difficult to be part of these activities when you are located in Washington, or elsewhere. Close proximity is very important and for all these reasons, a country needs to have presence here. What is the area that this Consulate General covers? Initially we were established to make consular affairs available to our citizens living here. Most of the consular services we provide are passports, legalizing various documents and a wide range of support to Lithuanians living in the USA. There are about 55,000 Lithuanian living in New York State according the latest census figures. We serve the entire East Coast from here and we serve the entire West Coast from here too until the planned Consulate General in LA opens its doors. Chicago's consulate general serving a local Lithuanian population of about 85,000 is the most important. Our New York location serves Boston and Florida too, two important centres of Lithuanian population and trade. Moreover, we also issue visas to people that require them to visit Lithuania and those that make Lithuania their first port of call to travel within the EU. How does a person know where to address herself if she needs particular official document? The individual jurisdictions are well defined and therefore a person living in, e.g., Pennsylvania knows that our office will serve her. Initially we need to see the individual in person; thereafter we can do a lot via the postal service. We serve 17 states and once the office in LA opens, they will serve the entire West Coast from Alaska to California. There is a gradual shift of Lithuanians moving from north to south in the USA. What are some of the other activities? Besides serving our citizens, we also assist some Lithuanian organisations and universities to establish contacts. We can help to build cultural and academic bridges. We organise concerts and promote Lithuanian artists. For important celebrations like the recent 25th anniversary of regaining our independence, we also invited prominent Americans, including politicians that played an important role in that part of our history. Speaking about history, we have an important role engaging with the large Litvak community based in New York, New Jersey and parts of the East Coast. There is a strong cultural and emotional link to Lithuania. Increasingly we have many applying for Lithuanian citizenship and reconnecting to their Lithuanian roots. The Litvak population plays also an important role in trade relations between the two countries. We meet regularly with Litvak organisations such as YIVO (Institute for Jewish Research), established in 1925 in Vilnius (then Vilna). During the war, many of the archives disappeared. Some remained in Lithuania, some went to Germany and yet other parts ended up in America. We still have large parts in Vilnius. These archives are now being digitized and brought together on one site. That includes photos from Vilnius and Kaunas, papers and even books dating back to the 17th century. The fascinating aspect is that these archives provide a good insight in the history of Lithuania. Therefore, we are happy to assist YIVO with building these archives. How important is the business activity of these New York based companies for Lithuania? Increasingly the Lithuanian diplomacy focuses on promoting Lithuania as a place to establish a business. We make sure that American decision makers get to know the Lithuanian success story. We can be very proud of being one of the fastest growing economies in Europe. We evolved from being one of the poorest countries in Europe to coming fast closer to the EU average. That is a real success story, something the country achieved within 15 years. That message is important to attract investment, promote trade and to have more tourists visit Lithuania. We have one of the most qualified and skilled labour forces in Europe. Particularly we have many people with technical and scientific education. Our Internet and overall IT infrastructures is among the best in Europe. Therefore, it is an important task for diplomats to engage with New York companies and to tell them about our highly educated young people. Many of these businesses are centres of excellence, or are first-class divisions of their respective companies. As a result, Lithuania aims to attract the best business we can get to the country, yet another crucial factor for being present in this city. It is a fascinating story in itself as to why historically all these excellent companies settled here. Which business activity does this Consulate General target? There is the traditional support for Lithuanian business that wants to export or expand their activity in this very large market. But nowadays most of our activity is linked to promoting Lithuania as a place to invest, and for American companies to start up activities in our part of the world and tap into the brainpower that our country has to offer. Clearly, the financial industry in this part of the country is a very significant component of that promotion. Given that the market is very important that also explains the attraction to Lithuanian companies that want to export or expand their activity in this very large market. We provide that support for Lithuanian business too. Most recently, we have assisted foodstuff exporters to get a foot on the ground in this market. Perhaps some recent investment successes from New York based companies setting up in Lithuania? The most recent investment success story is the NASDAQ, the largely automated stock exchange. They have decided to set-up a new competence centre for technology and business support in Vilnius. They plan to hire 50 specialists in the first part of this year. This is exciting! We have seen from similar previous investments, such as Barclays, that these companies start with modest job creation and often expand rapidly once they experience working with our graduates. Therefore, we have good hope they (NASDAQ) may expand into accounting and other activities. How significant is tourism from America to Lithuania? It is a fast growing segment. Most recent year-over-year figures show an increase of 25% of American tourists visiting Lithuania. That is extremely important, as the geopolitical conflict between Russia and Ukraine has affected visits from Russian tourists. The same conflict has also forced many Lithuanian food exporters to look for alternative markets because of Russian sanctions. America is a good place to diversify their market activity. Russians also have to deal with a dramatic drop in the value of the rouble; whilst American benefit from a rapidly rising dollar. The dollar has risen spectacularly against the Euro in the last few months and leads to Lithuania being even more attractive to visit. We will actively promote Lithuania as a tourist destination. 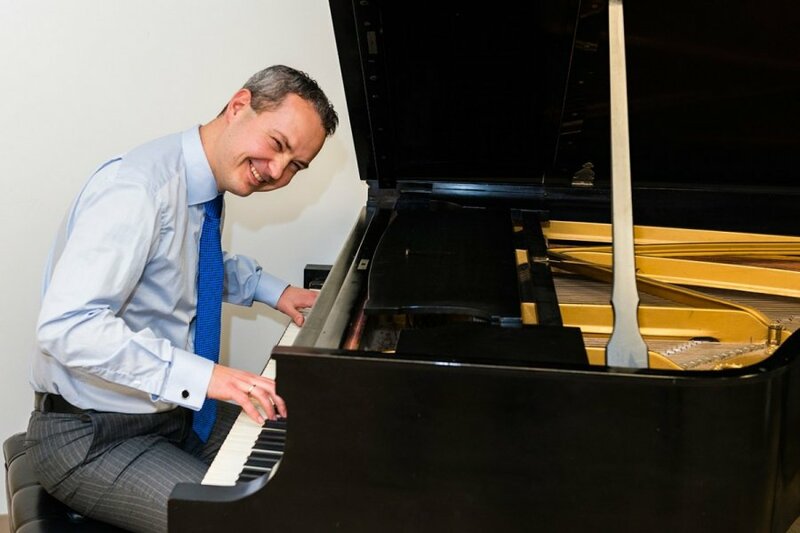 As we proceed to make a few photos for this article one of the staff suggest that the Consul General plays a few tunes on the grand piano that sits in the auditorium. 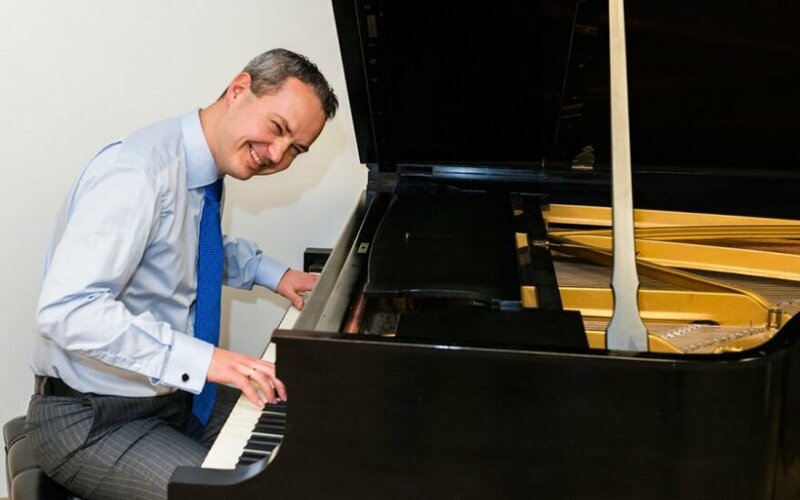 Julius Pranevičius seems to be a multitalented man. There appear to be more extra-curricular activities besides attending various community and official events. New York based minimalist composer Philip Glass has some Lithuanian musical talent to be reckoned with, right in the heart of Manhattan!